Bodaboda Baby: What's the time, Uganda? Airtime? Nice time?? Yes, these are the times. To be honest it's always these times in Uganda. But now it's also Breaking Boda News time. Don't look so excited, dear readers. Here's two minutes of boda news (maybe a bit longer, because let's face it sometimes things do drag on here in Africa). * Bodas have become even more decorative in the past week, swapping the usual chainsaws, wheelbarrows, and everything but the kitchen sink for palms to mark the Sunday before Easter. Here's one religious rider I spotted yesterday near the railway. Check it out. He appears to have his eyes closed, maybe he's saying an Easter Sunday prayer? That reminds me, I wonder what boda drivers have given up for Lent? Helmets? Okay, it's the best joke I can come up with. 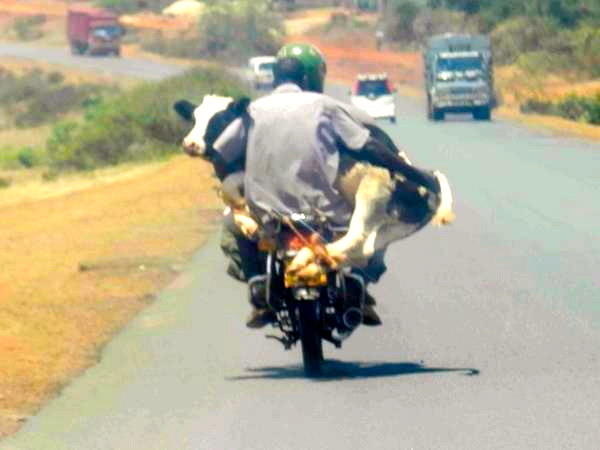 If you can do any better please let Bodaboda Baby know. * Cheryl Cole's hair extensions turn up on the front of a boda (we knew there was a reason that Girls Aloud announced they were splitting up last week). If a palm leaf doesn't do it for you, there's always this, umm, lovely piece of hair which was hanging off a bike I hailed to Garden City (where else?) earlier last week. * I spy with my little dust-covered eyes a...BOB (Bicycle-on-Boda) at Bunga. I still haven't seen a BOB (Boda-on-Boda), which regular readers of this blog know is a dream of mine (after I see one, I can then go under a boda, because what else will I be living for on this earth?) But I did spy a BOB (bicycle-on-boda) last Thursday night at Bunga, on my way home from town. * Kampala's Boda Tours, created by Walter Wandera, below, are going from strength to strength. Walter, who Bodaboda Baby caught up with this week at the Bahai Place of Worship, Africa's only such temple and one of the highlights of his motorbike tours, told me he's now attracting at least three tourists a day. His tours were recently labelled "Kampala's best kept tourism secret" by Uganda's New Vision newspaper and Walter continues to be mobbed by the local and international press, as seen below. 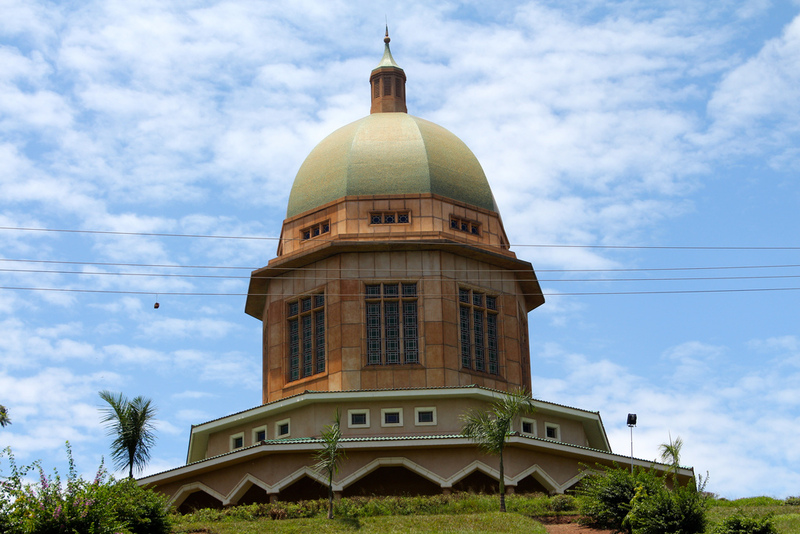 He describes the Bahai Temple, built in 1958 when Uganda was "thought to be the spiritual heart of Africa" as the "quietest place in Kampala", a lot more quieter than some of the country's roads, where you can even see a cow on a boda. (See pic below, taken by Walter). Photo courtesy of Walter Wandera. 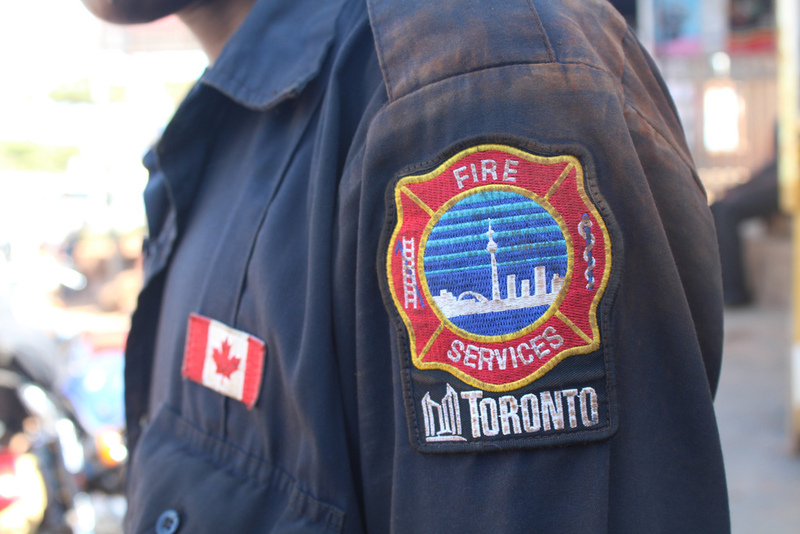 * Fire in Kampala? Canada's to the rescue! 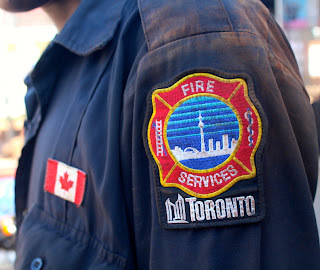 It was good to see the Toronto Fire Services out on the streets of Kampala this week, ironically not far the World Heritage listed Kasubi tombs which burnt down in 2010, while finishing up Walter's boda tour at a restaurant. 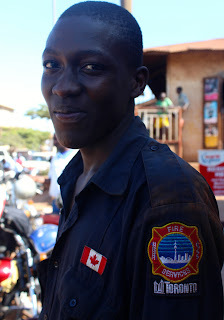 A photo below for my Toronto-born Mum, and Emily from Geolodges Uganda, who hails from Canada too. Please send me your boda news, people! Until next week stay safe on the roads and... NYC TYM (translation: nice time).